With less than a week to go before this year’s International CES Show in Las Vegas commences, it’s unclear which new products will generate the most buzz among attendees of the massive trade show. However, Ultra HDTVs, Windows 8 tablets, smart appliances, and smartphone apps figure to fight for center stage. Tech companies tend to be tight-lipped about specific product details in the run-up to the biggest tech trade show of the year, but we expect the march toward total connectivity to continue on the CES showfloor. Camera-equipped smart vacuum cleaners, Internet-connected TVs, mobile apps for controlling your home’s heat, and Wi-Fi cameras that can upload your photos to Facebook will dot the large landscape of the Las Vegas Convention Center. Though gadgets remain the stars of CES, manufacturers are building on a foundation of hardware innovation with incremental updates, accessories, and apps that connect the gadgets. “We’re seeing not only the broad adoption of technology, but also density is increasing,” says Shawn Dubravac, research director for the Consumer Electronics Association. Dubravac points to tablet ownership, which has increased from one in ten households less than two years ago to one in three today. Dubravac says that he expects CES 2013 to be “the largest apps show in the world,” a prediction driven by wider adoption of tablets and smartphones. “You’re going to see apps influence every aspect of the show,” Dubravac says. Apple, one of the major drivers behind the growth of smartphones and tablets in recent years, has no official presence at CES; but mobile apps and accessories designed for iPhones, iPads, and Macs will have a strong presence the showfloor. Microsoft won’t be there, either, after ending its CES run last year, but the company and its products will cast a long a shadow as Redmond’s partners in hardware, accessories, and apps display their Windows 8 wares. The 2013 edition of CES comes at an awkward for the PC industry. The big Microsoft news, the release of Windows 8, occurred in October. Intel’s upcoming Haswell processor is still a few months away. Graphics chipmakers AMD and Nvidia have new products impending, but are unlikely to launch them at CES. The Windows 8 launch, however, positions most PC makers to roll out the bulk of their Windows 8 products at CES. Windows 8 tablets, based on Intel’s latest Atom Z2760 processor, have rarities until now, but we’ll probably see lots of them on display in Las Vegas. Additional hybrid designs are on the way, too, as are more budget-friendly clamshell laptops, with and without touch interfaces. LG has a number of Windows 8 PCs planned for CES 2013, including its LG Tab-Book H160 hybrid notebook featuring an 11.6-inch display, a slide-out QWERTY keyboard, Wi-Fi, Bluetooth 4.0, HDMI, USB, and a MicroSD slot. At CES, LG also plans to display an Ultrabook version of the Tab-Book, another Ultrabook called the Z360, and a 23-inch touchscreen all-in-one PC, the V325. The H160 is already available in South Korea and is importable via an Amazon third-party seller for $1400. Presumably, LG will announce a U.S. ship date for the H160 during CES. Aside from the Windows 8 tablets on display next week, we expect to see scores of cheaper, generic alternatives from Asian manufacturers, some with Android Jelly Bean operating systems. Specialized Android tablets are on the horizon, too. Already, as CES approaches, we're hearing talk of tablets aimed at kids, gamers, and seniors. Windows Phone 8 fans will be excited to see Samsung at Pepcom’s Digital Experience event, which coincides with CES. The electronics giant will show off its ATIV S smartphone at the Monday night showcase. Included in October’s Windows Phone 8 launch event but still awaiting its U.S. debut, the ATIV S is the only Windows 8-powered handset to feature a metallic hairline design, as opposed to the candy-colored looks we’ve seen from HTC and Nokia. 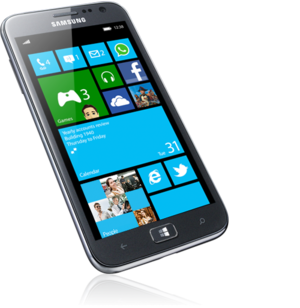 Bearing a strong resemblance to such Android handsets such as Samsung’s Galaxy S III, the ATIV S has a slim design with curved edges and is the only Windows Phone 8 handset to include a physical Home button. The ATIV S also has a 4.8-inch Super AMOLED display, an 8-megapixel camera with LED flash, and near-field communication (NFC) sharing. Speaking of NFC, the wireless connectivity technology is becoming an increasingly common—and expected—feature in smartphones. As more consumers embrace mobile payment apps on their handsets, companies are providing digital coupons or loyalty passes to encourage their use. Screen sizes continue to get bigger, blurring the line between large smartphone and small tablet. Huawei reportedly plans to promote a super-size 6.1-inch Ascend Mate "phablet" with either 720p or 1080p resolution at this year’s CES. The smartphone was spotted in late December at a Huawei retail store in China, according to Engadget. The massive Ascend Mate will likely feature a 1.8GHz quad-core processor. Observers also expect Huawei to unveil a Windows Phone and several Android-based handsets during the show. Chinese manufacturer ZTE plans to introduce a new flagship Android phone, the Grand S, at CES. The electronics maker claims that the Grand S will be the world’s thinnest 5-inch phone. The ceramic smartphone will reportedly offer 1080p resolution. Still, CES may not be the year's best trade show for new smartphone sightings. We expect the lion’s share of 2013 phone announcements to happen at Mobile World Congress, which kicks off on February 25 in Barcelona, Spain. Though Apple doesn’t participate in CES—or any trade show, for that matter—many iOS app developers do make the trek to Las Vegas, touting their latest mobile apps and services at the show. Apps for iOS devices will be everywhere at CES this year, but especially in the form of connected apps that enable iPhones, iPads, and iPod touches to control other devices remotely. One of the biggest categories for connected apps will be mobile entertainment. The Mobile TV Tech Zone in the Central Hall will showcase a slew of entertainment apps, especially ones that let you stream live TV straight to your iOS device. We expect Elgato, the company behind the EyeTV tuner that debuted at CES in 2012, to make a new announcement at this year's show. The EyeTV is a small tuner that connects to an iPhone or iPad and receives a TV signal through Dyle’s mobile TV network, which then allows the user to watch live TV through the EyeTV Mobile app. Similar iOS apps designed to turn devices into “second screens” for watching televised content will have a heavy presence on the show floor as well. Innumerable accessory makers will set up shop at CES, hoping to garner some attention for the add-ons they make for Apple’s smartphone and tablet offerings. Early indications from exhibitors suggest an avalanche of cases designed to protect the high-resolution screens of the iPhone 5 and fourth-generation iPad, along with the recently unveiled iPad mini. Accessory manufacturers have been particularly enthusiastic about fitness tech. From digital pedometers and heart monitors to scales, apps, Web services, and sport watches, fitness technology should hit its stride at this year’s show.